Become a consignor. Send us a list of posters (and/or images) you want to sell. We will review your items and then discuss suggested reserves, estimates and consignment charges with you. Upon request, ship your posters to us. Consignments must be received at least 2 1/2 months in advance of a sale. Review, sign and return the Consignment Agreement. We will issue payment for sold items 6 weeks after the auction. 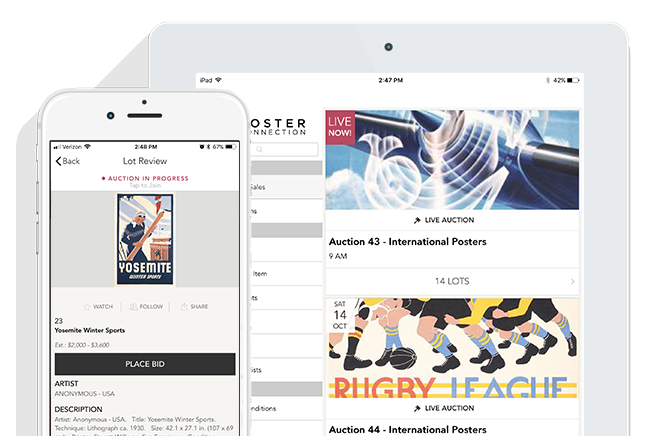 PosterConnection is currently accepting posters for consignment for its winter and spring 2019 sales (Winter Sale on January 29 and Auction 48 in April 2019). If you are interested in consigning posters, please fill out the form below, e-mail us at auctions@posterconnection.com or call us at 925-673-3343 and we will review your suggested items for consignment and answer any questions you may have. Consignments for our clearance sales will be accepted throughout the year. The deadline for our April sale is January 15, 2019.